Someone gifts you a fresh rose- beautifully red, sweet smelling, attractive, just wonderful. You love to see it, smell it. You admire its beauty and may be even wonder about how wonderful Mother Nature is. You simply find it so very beautiful and attractive. You place it in a very special space ensuring its safety, trying to help it maintain its freshness. You also make sure you have placed it such that you can keep seeing it every now and then. Yeah, it’s the fresh red rose. And you don’t miss noticing it every time you happen to see it. But as it is the most natural thing, time changes everything. 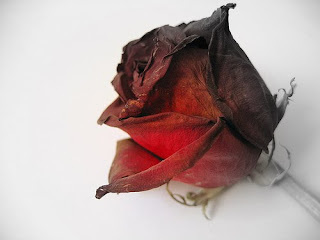 The rose becomes stale sooner or later. It’s still there in the same place where you had kept it because it has not rotten yet. The rose is beautiful but no longer fresh. And losing the freshness makes it lose its attraction. The rose doesn’t attract you anymore to notice its eternal beauty. Now you don’t really care about its safety because you kind of think nothing else can go wrong with it... or may be you never find time to notice it. May be you are just waiting for it to wither so that you can throw it away… or may be you don’t care about what next to do with it. The flower is still a part of your house but one of the least cared for. It has lost all its attraction and attention. Now, it’s a stale flower. A new relationship is so crisp, smooth and wonderful. You love every moment of being together. Everything is so special. You just don’t want to stop looking into each other’s glowing eyes. The most difficult thing to do is to keep your eyes off their admirable face. You wish you could hold hands and keep talking (even senseless stuff) forever. You listen to every word of that special someone so carefully. The most adorable thing is their smile. Your knees go weak when you see their charming face. Oh, that strong attraction. The expression of love makes your heart beat faster and you just want to hug and say “I love you too”. You blush when your friends tease you about it. Every time your phone rings, you hope it is nobody else. You keep seeing your phone even when it doesn’t ring. You keep waiting all the time for the next meeting. For that one hour of date everyday, you spend all the other 23 hours thinking about what you would say and how. It is all so cozy and rosy- a new relationship. And yet again, the destined evil- Time! Everything changes from special to not-so-special to casual. Although you become a special part of each other’s lives, there is barely anything so special. Everything becomes so very casual. You forget the joy of those long hours of being spellbound into each other’s eyes. You find nothing special about all the talking unless it is really important. You start hearing them more than you listen to them. Holding hands gives no thrills anymore. Smiles become an obvious- absence of smiles may be noticed but presence wouldn’t be too special. You barely find yourself admiring that same face for such long moments as in those days. “I love you” although doesn’t lose its meaning but probably loses the feeling of special-ness. There is no novelty in the relationship, all the attraction is gone with the wind. Everything that was once so special becomes more like a habit and very casual. You don’t know where you are heading, and you don’t even care to find out. You reach higher levels of understanding and closeness. Your bonding is stronger. Yet, ironically, you take the relationship for granted. yeah taken for granted is a nuisance, but that does not mean one needs the 'trials and errors', it only creates more chaos in life..... complexity is something that humans long for and that is exactly what they'll get if they'd want 'reassurance'!!! I always mention that there are different kinds of people and they feel differently... Its just that some people not only like the feeling special part but also hate being taken for granted at any point in time and hence, the casualness isn't pleasant! Now here comes a writer with mature thought process..kudos..kudos..!! Yup the flower goes stale as it is destined to be. But, I feel, people make a mistake here. They fall in love with the flower and not the plant. Let me break it down for someone who shows a disdain to this thought. The flower is just representing the outer beauty of the plant. If someone falls in love with blush on the cheeks, spark in the eyes, magic in the voice or for that matter a perfect figure, its insane. Its the person who's carrying the beauty being neglected. Love is born in heart and is to be borne in the heart. And for me such a relationship can never go stale and wither. I like this blog especially because it actually has a deep hidden meaning. No reader but only a lover (someone who has truly been in love) can appreciate the true beauty of words gracing this blog. You are right dear... Yet again,you state the basics of what i have written here... But still, its ironical dat d charm of the relationship fades wid time even wen u luv d person for wat d person is... d flower of d relationship gets stale wen u start taking for granted those little gestures which used to be tremendously joyous at some point in time... they become as casual as a routine as the dynamics of the relationship change wid d growing expectations from each other as time passes!